With a strong start in this year Facebook, Inc. (NASDAQ: FB) will continue to focus connecting the world with the social network Facebook.com, Instagram, Messenger, Whatsapp and Oculus. The revenue for the first 3 months in 2015 is $ 3,543 million and is nearly $ 1 billion more one year ago for the same period. Here is some statistics for this period. 1. 936 million active users every day. This is an increase of 17 % year-over-year. 2. Increase of 31% of the mobile users - 798 million per day. 3. The monthly active users are 1.44 billion with an increase of 13% for 1 year. 4. The mobile monthly active users are 1.25 billion - 24 % more. 5. Think about to buy Facebook Stock and let's see what will they do next year. 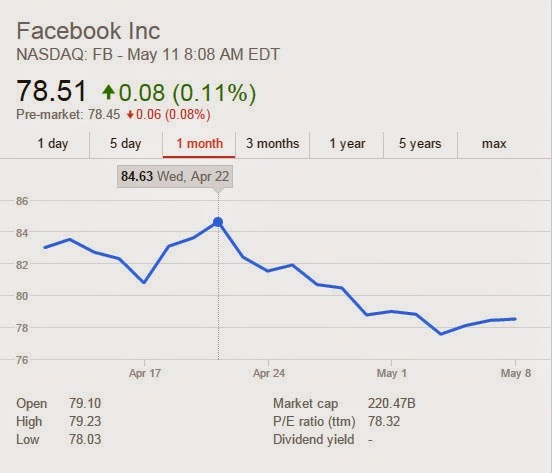 You can check the full report on the official Facebook Stock Investor website.